Tel Aviv, at the heart of modern Israel, was founded north of Jaffa in 1909 by Zionist Jewish pioneers who believed in the biblical return to Zion. The name Tel Aviv is taken from Ezekiel’s vision of the Valley of Dry Bones. 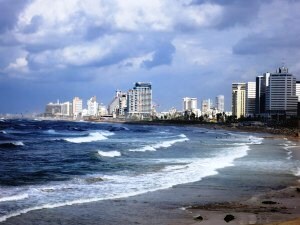 Tel Aviv is also known as the White City, referring to over 4000 buildings built in the Bauhaus or International Style by Jewish architects and refuges that fled Hitler’s Germany in the 1930’s. Tel Aviv is a UNESCO World Heritage Site. We are overlooking the busy, bustling, modern day metropolis of Tel Aviv from Old Jaffa. Locals call Tel Aviv the “Big Orange” named after the famous Jaffa oranges that still grow in area. In fact, you might have seen them from the airplane as you approached for landing. We can see ultra modern office buildings going up everywhere, in an assortment of interesting shapes and there are beautiful new garden condos lining the water front promenade. Would you believe that in 1909, when Tel Aviv was founded outside the walls of old Jaffa, there was little more than sand dunes, sand flies, and malaria here. Today, Tel Aviv is a vibrant cosmopolitan city at the heart of the most dynamic economy in the Middle East. And this without one drop of crude oil below the surface, though there have been recent discoveries of natural gas. Tel Aviv also has the world’s largest exchange for polished diamonds and a world leader in high tech start-up companies. Tel Aviv is also the music and theater center of Israel. And all of this for a country just over 65 years old, that has faced an uphill battle for survival from the beginning. Let’s examine how Tel Aviv got here- how it started. It’s a story that goes back a little over a hundred years ago- to the turn of the 20th century. There was an awakening of Jewish nationalism calling for a real practical return to Zion. We were always used to praying for the return to Zion, and still do. But this was different. This was a pro-active movement. A movement that said “just do it” and God will help and protect us along the way. Back then, a handful of Jewish people arrived here by steamer from Europe, to the port of ancient biblical Jaffa. They came, not as tourists, but as pioneers; to fulfill a crazy dream – to rebuild the ancient biblical Jewish homeland. They were fired by a longing, an inner call for the Return to Zion. The reality they met when they got off the boat was very different. Back in those days, before WWI, Palestine was just emerging from a deep slumber. It was a disease ridden backwater of the Ottoman Empire with malaria, glaucoma, no electricity, no running water, and an often hostile and a deeply corrupt local officials. Nevertheless, overcoming hardship, these early Jewish settlers managed to purchase some land – sand dunes just outside the ancient walled city of Jaffa- the area in the foreground of the photograph, plan a new neighborhood, build their homes, and set down roots. The original neighborhood still exists, with gabled roof homes, narrow cobblestone streets, and even an old synagogue. What motivated them to come and invest their last pennies in an insecure place? No hard-nosed investment counselor would have suggested sinking time and money into such a troubled region! The answer is linked to the origin and meaning of “Tel Aviv”. The name “Tel Aviv” comes from the prophet Ezekiel’s “Valley of Dry Bones” vision (Ezekiel 37:1-14) and is the place in his imagination that the vision unfolds. The story goes like this: In the year 586 B.C., the great Babylonian empire of Mesopotamia ( the area of Iraq today) was on the war path and conquered Jerusalem, laying waste the great Temple of Solomon. The Jews were taken into captivity and exiled to Babylon (southern Iraq today). There was a great sense of despair among the Jewish people. Even loss of faith. Existential questions were raised. How could our god Yahweh allow his House to be destroyed, his chosen people to be scattered? What about His promise to Abraham? Does God go back on his promises? It was the prophet Ezekiel, the man of God, the man of faith who was exiled along with his people that rose to the occasion. He had a vision- the Valley of Dry Bones, reminding us that God’s promises are eternal. That there will come a time when the dry exiled bones of the nation of Israel would come to life again in His promised land. And so, when a handful of young Zionist families came from Europe as pioneers, fulfilling the biblical belief in the Return to Zion, bought some desolate sand dunes north of Jaffa to build their homes, they were like dreamers. They acted on vision. They sensed that they were active instruments of God in the building of a dream, the fulfillment of prophecy. In their minds they weren’t just building another neighborhood, but were laying the foundations for a new city. They dared dream that their little neighborhood would grow to become the infrastructure for the return and resurrection of the dry exiled bones of the Jewish people to their ancient home. Like the ripples that emanate from dropping a pebble into a pond, their tiny initiative – would grow into something greater than themselves. And why is the name of the place that Ezekiel had his Vision of the Dry Bones called “Tel Aviv”? The name Tel Aviv is Hebrew, literally meaning “Hill of Spring”. Spring symbolizes rebirth and therefore encapsulates the whole message of the Vision of the Dry Bones- the promise of rebirth and new life that comes from the Lord. With the rise of Hitler many German Jewish architects fled and settled in Tel Aviv, bringing with them the Bauhaus or International Style of building. Today there are over 4000 buildings in this style in Tel Aviv, collectively known as the White City, and UNESCO has declared the ensemble a World Heritage Site. For more information about visiting Tel Aviv, the Bauhaus White City, contact Zack Shavin, veteran Israel guide and biblical archaeologist at Land of Israel Tours. This entry was posted in Coast and tagged Holy Land, Israel, Jaffa, Tel Aviv by zshavin. Bookmark the permalink.